" A sweet entry to reading." Biscuit is now a soft plush doll, too! He is made by MerryMakers, Inc. and is available here. Biscuit is happy to be represented by MerryMakers for all licensing and merchandising. The Biscuit "I Can Read" books are now available as ebooks from iTunes (iPad) Barnes and Noble (Nook) and Amazon (Kindle). There are several apps available too, with more on the way! Biscuit is now on Facebook. "Like" this page and join in the fun. Great for teachers and librarians, as well as parents eager to learn what they can do to help young children with their reading. published by HarperCollins, written by Alyssa Satin Capucilli and illustrated by Pat Schories. See more Biscuit Board Books. 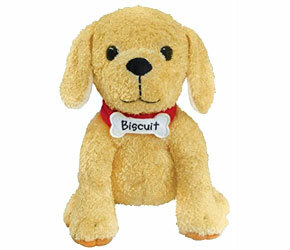 See HarperCollins.com for all the books about Biscuit the puppy.